Click here for details of the instrument performance. The Advance Whole Air Sampler (AWAS) consists of 31 canisters mounted in the centerline belly pod of the ER-2. The canisters are filled with ambient air following a programmed sequence during flight. The fill sequence will be optimized to provide increased resolution during profiles and less frequent sampling during level flight legs. Remote control of sample collection from ground computers allows targeted sampling of specific features during flight. Following each flight, the onboard full AWAS canisters are replaced with a new set of prepared empty canisters. Full canisters are returned to the Atlas laboratory at the University of Miami and analyzed on a multi-channel, multi-detector gas chromatograph system for a variety of trace gases (see Table). Canisters contain residual ambient air following chromatographic analysis, which can be used for additional analyses not included in the core DCOTSS data products (e.g., stable isotopic composition of CH4 or N2O). The NASA Compact Airborne Formaldehyde Experiment (CAFÉ) is an in situ instrument capable of measuring formaldehyde throughout the troposphere and lower stratosphere. The instrument flies in the superpod midbody on the ER-2. CAFÉ uses laser induced fluorescence to obtain the high detection sensitivity and fast time response needed for airborne measurements. The instrument is designed for autonomous operation in flight and requires minimal support between flights. An inlet mounted in the free stream samples ambient air. [St. Clair, et al., 2017]. The NASA Compact Airborne Nitrogen diOxide Experiment (CANOE) is an in situ instrument capable of measuring nitrogen dioxide (NO2) throughout the troposphere and LS. Except for the detectors, CANOE is a duplicate of CAFÉ. CANOE flies in the superpod midbody of the ER-2. The Harvard Halogen instrument measures ClO and BrO in situ via a two-step process: chemical conversion to Cl and Br atoms via a rapid bimolecular reaction with NO, followed by atomic resonance fluorescence detection of Cl and Br in the vacuum ultraviolet. The instrument is located in the superpod forebody of the ER-2. The flow of ambient air through the instrument is controlled by a single primary bypass duct from which the laminar core is extracted and decelerated into two nested, mirror-image secondary ducts each with two axes for the detection of halogen radical species. The 4-axis design enables multiple ClO and BrO detectors to be present on each flight. The Harvard Ozone (HOZ) instrument is an in situ ultraviolet photometer for measuring ozone (O3) throughout the upper troposphere and lower stratosphere. HOZ flies in the superpod aftbody of the ER-2. The instrument detects the direct absorption of 254 nm radiation emitted by a feedback-stabilized UV LED folded path. A 3-way Teflon solenoid valve directs the air flow alternately through a scrubber assembly and into the absorption cell to measure I0, or directly into the cell to measure I, for the determination of ambient O3 concentrations. The Harvard University Picarro Cavity Ringdown Spectrometer (HUPCRS) consists of a G2401-m Picarro gas analyzer (Picarro Inc., Santa Clara, CA, USA) repackaged in a temperature-controlled pressure vessel, a separate calibration system with 2 multi-species gas standards, and an external pump and pressure control assembly designed to allow operation at a wide range of altitudes. HUPCS flies in the lower Q-bay. The Picarro analyzer uses Wavelength-Scanned Cavity Ringdown Spectroscopy (WS-CRDS) technology to make high precision measurements of greenhouse gases [Crosson, 2008]. HUPCRS reports concentrations of CO2, CH4, and CO every ~2.2 seconds and the data are averaged to 10 seconds. The current version of the Harvard Water Vapor (HWV) instrument combines two independent measurement methods for the simultaneous in situ detection of ambient water vapor mixing ratio in a single duct. HWV flies in the super-spear forebody. This dual axis instrument combines the heritage of the Harvard Lyman-α photo-fragment fluorescence instrument (LyA) with a tunable diode laser direct absorption instrument (HHH) [Weinstock et al., 1994; Sargent et al., 2013]. Both axes yield 1 Hz measurements of water vapor from ~1 to 1000 ppmv. Measurement accuracy is determined through a combination of careful laboratory calibrations and in-flight diagnostic tests [Weinstock et al., 2009; Smith, 2012]. MMS provides calibrated, high-resolution measurements of ambient meteorological parameters (pressure, temperature, turbulence index, and the 3-dimensional wind vector) at 20 samples per second. MMS measurement ports are located in the aircraft nose. MMS consists of three major systems: (1) an air motion sensing system to measure the air velocity with respect to the ER-2: (2) a motion sensing system to measure the ER-2 velocity with respect to the earth: and (3) a data acquisition system to process and record the measured quantities. In addition to the meteorological parameters listed above, MMS provides accurate and precise measurements of potential temperature, true airspeed, GPS position, aircraft velocities, accelerations, pitch, roll, heading, angles of attack and sideslip, dynamic and total pressure, and total temperature. The PALMS instrument measures single-particle aerosol composition using UV laser ablation to generate ions that are analyzed with a time-of-flight mass spectrometer. PALMS flies in the aircraft nose. The PALMS size range is approximately 150 to >3000 nm and encompasses most of the aerosol volume. Particle mass spectra allow individual aerosol particles to be classified into broad compositional categories: sulfate-organic mixtures, biomass burning, elemental carbon, mineral dust, sea salt, meteoric, industrial, and oil combustion. PALMS also provides a variety of compositional tracers to identify aerosol sources, probe mixing state, track particle aging, and investigate convective transport and cloud processing. Harvard's Printed Optical Particle Spectrometer (POPS) is an in situ instrument capable of measuring particle number density as a function of size throughout the UTLS. The instrument uses a 405-nm diode laser to count and size individual particles (independent of composition and phase) in the size range 140-3000 nm. The instrument is designed for autonomous operation in flight and requires minimal support between flights. The instrument is commercially available (Handix Scientific, Boulder, CO). For DCOTSS a custom inlet is mounted in the free stream to sample ambient air. POPS has also been installed on small UAVs [de Boer et al., 2016; Telg et al., 2017]. The Unmanned Aircraft Systems (UAS) Chromatograph for Atmospheric Trace Species (UCATS) was designed and built for autonomous operation on pilotless aircraft. UCATS is situated in the Q-bay. It uses gas chromatography (GC) to separate atmospheric trace gases along a narrow heated column, followed by precise and accurate detection with electron capture detectors. There are two GC channels on UCATS, one of which measures N2O and SF6, the other of which measures chlorofluorocarbons (CFCs) and halon-1211. In addition, there is a small ozone instrument and a tunable diode laser instrument (TDL) for water vapor. The Water Isotopologues - Integrated Cavity Output Spectrometer (WI-ICOS) is a direct absorption instrument designed for the in situ measurement of H2O and HDO. WI-ICOS flies in the superpod aftbody. It uses a continuous wave distributed feedback (cw-DFB) laser to scan across ro-vibrational lines of H2O and HDO in the mid-IR. 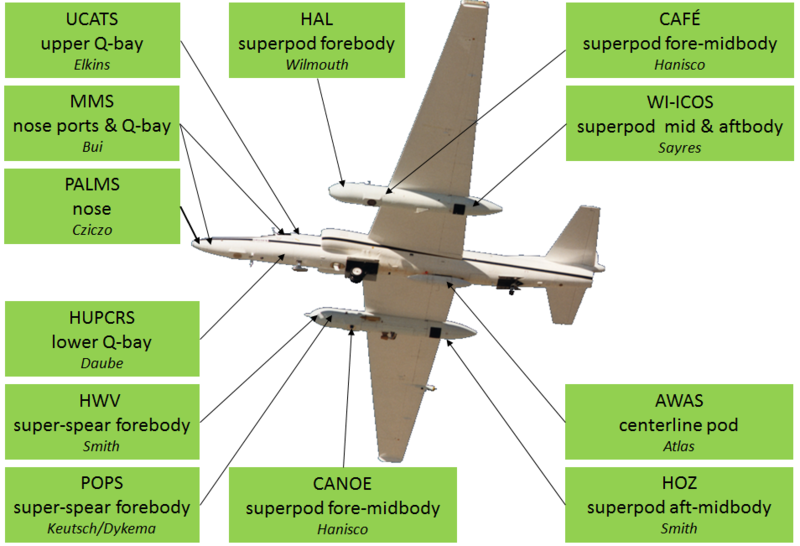 The current instrument is a modified version of an instrument that flew on the WB-57 during AVE-WIIF, CRAVE, and TC4 [Sayres et al., 2009; 2010]. Due to the low water vapor mixing ratios in the stratosphere, the absorption cell is composed of two highly-reflective mirrors that increase the effective pathlength by a factor of 2500. Ambient air is sampled by a side facing inlet that protrudes from the body of the superpod into free stream air.